Brooklyn was rescued from the Canidrome. Watch his journey to freedom! 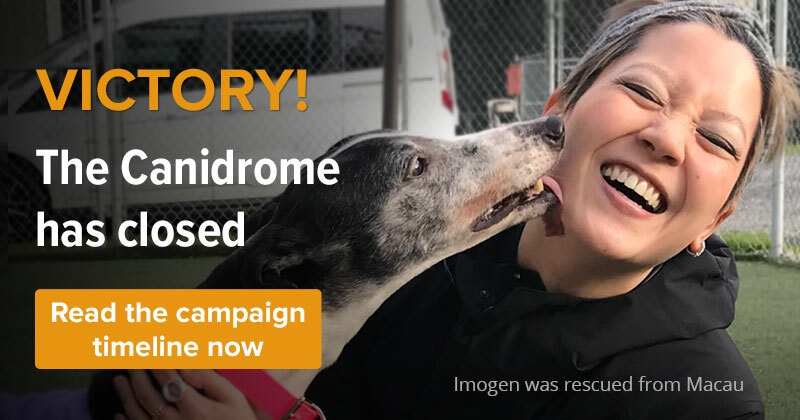 Now that Canidrome has closed, we are sponsoring over 500 greyhounds to freedom with our allied adoption groups around the world. 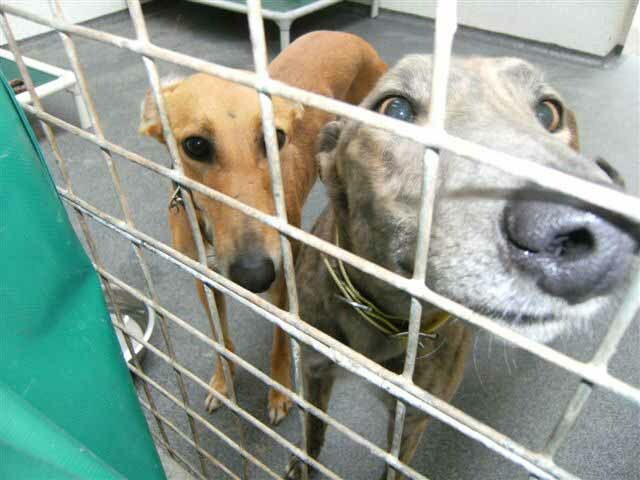 Won't you please give now to provide love and care for these dogs? We will continue to sponsor each dog as long as funding lasts, so please be as generous as you can! These are the Canidrome greyhounds - zoom in to see all the dogs! Associated Press, "Macau takes in 533 dogs after Asia's only race track shuts," The New York Times, July 21, 2018 nytimes.com (accessed July 24, 2018). Olivia Rosenman, "50 years in operation for Macau’s Canidrome for greyhound races," South China Morning Post, September 1, 2013 scmp.com (accessed July 24, 2018). K Morrison, "Macau Canidrome closing; must relocate 600 greyhounds," World Casino News, July 3, 2018 news.worldcasinodirectory.com (accessed July 24, 2018). Raquel Carvalho, "Final battle to save Macau’s exploited racing greyhounds," South China Morning Post, July 23, 2017 scmp.com (accessed July 24, 2018). Simon Parry, "Owners angry as Macau Canidrome fails to stop euthanizing retired dogs," South China Morning Post, December 16, 2012, grey2kusa.org (accessed July 24, 2018). Farah Master, "As Macau's greyhound track shutters, fears over dogs' fate," Reuters, June 19, 2018, reuters.com (accessed July 24, 2018). Raquel Carvalho, "Final battle to save Macau's exploited racing greyhounds," South China Morning Post, July 23, 2017, scmp.com (accessed July 24, 2018). Australia Associated Press, "Australian greyhounds ending up in China," SBS News, September 22, 2017, sbs.com.au (accessed July 24, 2018).